Chanting, dancing and breath-work have been used for centuries as shamanic vehicles for expanded consciousness. They are ways we tap into vibrational awareness, flow and other ways of knowing and being. 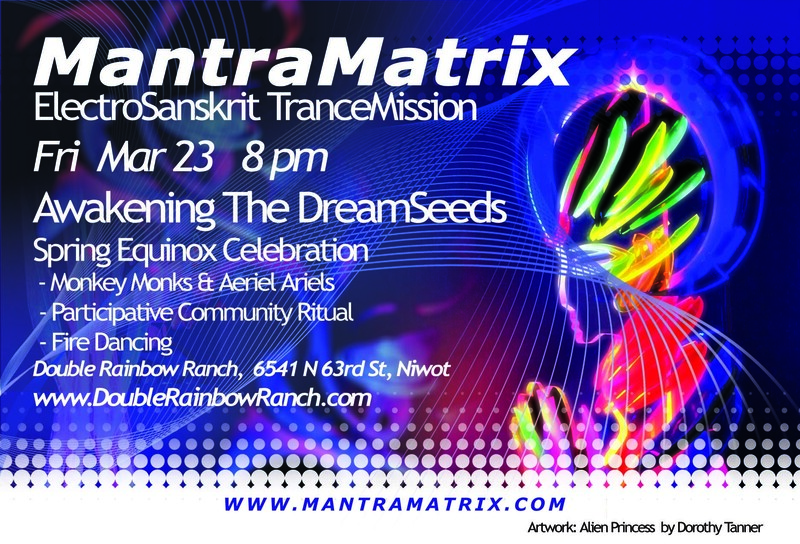 In this lightly facilitated gathering we take an intentional journey into transformational space, integrating yogic movement, mantra-chanting and energy work to polish our luminous diamond-body essence while DJ MantraMatrix mixes a sonic kaleidoscope of live mantra chanting and trance-electronica beats. It is a kirtronica experience of divine bliss. The music ranges from etheric ambient landscapes to wild, Kali-shaking dubstep glitch. We start by chanting Sanskrit mantras together. Mantras are ancient sonic codes for archetypal energies, like peace (Shanti), bliss (Ananda) and cutting through obstacles (Ganapataye). Then we bring in the dance beats to move our bodies into ecstatic flow. The Diamond Body work is a visualization practice that aligns our energy body with our purse shining “Vajra” essence. Boulder’s thriving yoga community now has a great series of bi-weekly festivities: Friday Night Yoga Club (FNYC). Each event runs from 5:30–8:30 p.m., and pairs a playful all-levels asana practice with live music in a supportive, celebratory environment. Guests can expect healthy food and beverages from sponsors along with sample massage and acupuncture treatments. This will be an intentional and experiential journey into transformational space, integrating yogic movement and breath-work with mantra chanting & dancing. 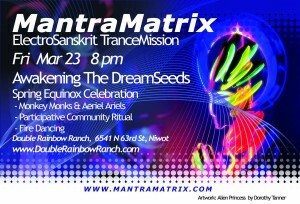 It is a facilitated gathering with meditation, group sharing and super-funk dancing. Please arrive on time to be part of the full flow.